Earlier today [Jan 31] Minister of Cabinet Office with Responsibility for Government Reform Lovitta Foggo met with the Chamber of Commerce to discuss the Code of Practice for Project Management and Procurement. 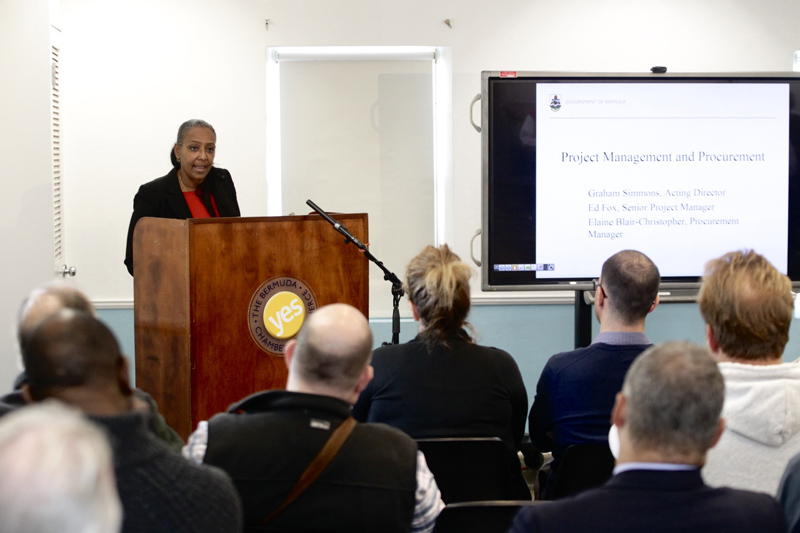 Speaking at the presentation, Minister Foggo said, “Thank you for affording us a bit of time today to discuss the Government’s Code of Practice for Project Management and Procurement and its implementation. “The Code outlines how public officers will procure goods or services on behalf of Government. It represents part of the continuing efforts by the Government to improve good governance measures, promote “best practice” in project management and procurement; and to provide oversight of all Government procurement. Please know that the Government aims to use its purchasing power to promote equality of opportunity with regard to disability, gender and race. “Implementation of the Code will facilitate the establishment of a more level playing field and diverse contractor base by ensuring that specified businesses have access to, and the opportunity to win Government contracts. Our aim is to work with local contractors to support the local economy. “To this end, Chamber members should be aware that preference in the awarding of contracts will be given to small and medium-sized businesses and businesses with a well-established Bermudian employment base. “We believe that by giving small and medium-sized businesses a fairer chance to secure Government contracts, we will stimulate innovation, achieve the best value for money and obtain better quality goods and services. 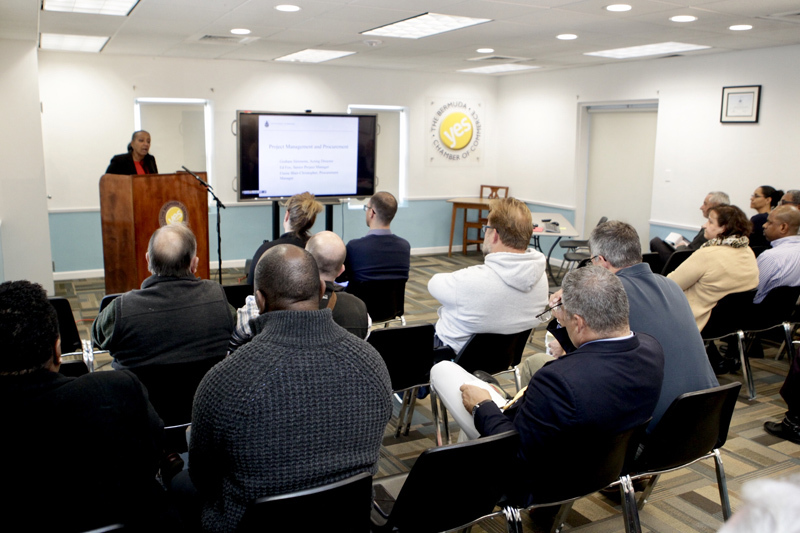 “Our goal is to work in close partnership with such organisations as the Chamber of Commerce, the Bermuda Economic Development Corporation, the Construction Association of Bermuda and other groups to educate small and mid-sized businesses and entrepreneurs on the Government’s tendering requirements. “And in doing so, smaller businesses will be aware of and have better access to potential public sector contracting opportunities. The Acting Director of Project Management and Procurement, Mr. Graham Simmons will share more details about the Code and how it relates to the Chamber membership in his presentation. “However as I close, I just wish to note that since becoming Government, we have worked tirelessly to put safeguards in place to ensure that the integrity of the public office is upheld. “This Government is committed to good governance and ensuring that the operations and financial affairs of all public authorities are open and transparent. How did that work with the minibuses? Did these rules apply when they bought themselves shiny new cars, using our money? And where can one obtain a copy of the new Code of Practice for Project Management and Procurement? How did that work with Fortress Group getting the $100M Infrastructure Fund?? Has she read the Commission of Inquiry Report? Code words – Equal opportunity – if you are a member of the LGBT Group you know that does NOT apply to you, but it does mean if they can find a picture of You at a “PLP RALLY” you are in like FLYNN! !